Established in 1998, Real Time Gaming is an experienced online casino software company that has risen through the years to become one of the big players in the industry. Real Time Gaming has developed the software for more than 70 online casinos to date and continues to add more to its portfolio every year. Casinos powered by Real Time Gaming are generally noted for having large sign up bonuses and for accepting players from the US. In fact, one of the most prominent RTG casinos, PlayersOnly.com, only accepts players from the United States. But for the most part, RTG casinos accept players from around the world. Real Time Gaming casinos are especially popular among video poker players because RTG has developed over fifteen different video poker games. You'll see favorites such as Jacks or Better, Sevens Wild and many more. Each game has a slightly different setup but they are all easy to pick up for anyone familiar with video poker. The graphics on Real Time Gaming video poker machines are pretty solid but they don't look as up to date as the other games offered by RTG. I think a part of the reason is that video poker hasn't changed much over the years and a lot of players like it when their online games look the same as their live counterparts. As you can see the graphics are simple and keep the screen clean and easy to understand. 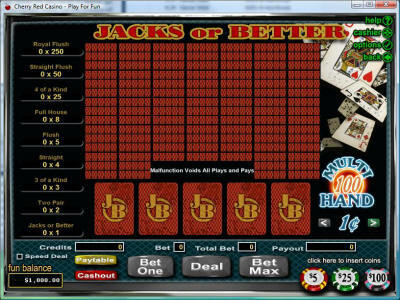 Real Time Gaming casinos offer the most options for video poker players on the Internet. Some other providers offer slightly better odds, but they cannot match the sheer selection that RTG provides. Real Time Gaming doesn’t involve itself with regulating the casinos it works for. This is strictly a software design company so you should perform your due diligence before signing up at just any random RTG casino. You can also learn more about RTG Casinos at RTGOnlineCasinos.org.